KIEV, Ukraine -- In what amounted to a multidimensional confidence-building campaign, President Petro O. Poroshenko of Ukraine tried on Friday to rally international support for his country and to maintain pressure on President Vladimir V. Putin of Russia, including economic sanctions. Ukrainian service members hauled a cart of ammunition on Friday in Maryinka, a town near Donetsk where they have been battling pro-Russia separatists. Mr. Poroshenko held a major news conference, gave interviews to foreign journalists, spoke by phone with President Obama and Chancellor Angela Merkel of Germany, and prepared to welcome two visiting prime ministers to Kiev, Shinzo Abe of Japan and Stephen Harper of Canada. His diplomatic activities precede a summit meeting of leaders of the Group of 7 nations that is scheduled to begin Sunday at Schloss Elmau in the Bavarian Alps, with security issues on the agenda. In each of his efforts, Mr. Poroshenko stressed Ukraine’s resolve to stem the Russian-backed separatist forces in the eastern Donetsk and Luhansk regions, its commitment to an overhaul of the national government, and its continued need for international support, including financial assistance, as the economy remains on the brink of default. “We will defend our country, our territorial integrity and our independence by ourselves,” Mr. Poroshenko said in an interview with journalists from a small group of foreign news organizations, including The New York Times. Fighting has flared recently in eastern Ukraine, a year after Mr. Poroshenko pledged to end the conflict. A cease-fire agreement brokered in February has reduced the violence but has never completely halted it. 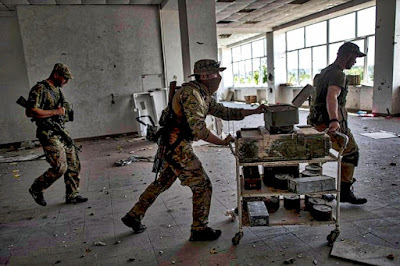 In some of the deadliest fighting since the accord, more than 20 soldiers were killed Friday in Maryinka, a town just west of the city of Donetsk. Mr. Poroshenko said at his news conference that Ukrainian troops had repelled an attack by as many as 1,000 pro-Russia fighters and captured 12 of them, including at least one Russian citizen. “We had some storming action by between 500 and 1,000 servicemen of the militants, with a large number of tanks and armored machinery, apparently counting on being able to quickly capture Maryinka,” Mr. Poroshenko said. He said Ukraine had informed international monitors from the Organization for Security and Cooperation in Europe that it would move heavy weapons back to defend the town, reversing a previous agreed withdrawal. The Kremlin has insisted that its military is not involved in Ukraine, though it acknowledges that some Russian citizens are fighting alongside separatist rebels; it says they are volunteers. Ukraine and its allies say Russia is behind the fighting and point to evidence that includes funerals of Russian soldiers killed in action. The United Nations Security Council held an emergency meeting in New York on Friday to discuss the escalation in the fighting. The Council was briefed by Jeffrey Feltman, under secretary general for political affairs, and Alexander Hug, the deputy head of the Organization for Security and Cooperation’s monitoring mission in Ukraine. “We are either looking at a return to a deepening intractable conflict or a momentary upsurge,” Mr. Feltman said. Samantha Power, the United States ambassador to the United Nations, said Russia and the Ukrainian separatists were to blame for the fighting and were trying to claim more territory in eastern Ukraine. “It seems the contact line can shift to include the territories that they feel they deserve,” she said. In the interview, Mr. Poroshenko said Ukraine had no choice but to keep trying to carry out the February cease-fire accord, brokered in Minsk, Belarus, even though fighting continued. In his call with Mr. Obama on Friday, Mr. Poroshenko appeared to get exactly what he wanted. The European Union’s economic sanctions against Russia over the conflict are scheduled to expire at the end of July, and the union has begun talking about extending them. That issue is expected to come up at the Group of 7 meeting. Critics of Ukraine, including Russia and the separatist leaders in Donetsk and Luhansk, say the government in Kiev is to blame for cease-fire violations, and they assail it for refusing to move forward with political components of the accord, including local elections and greater local autonomy. Mr. Poroshenko insists that his government cannot make any political concessions until weapons and fighters are removed from the east and the border with Russia is brought back fully under Ukrainian control. In public remarks on Friday and in a lengthy address to Parliament on Thursday, Mr. Poroshenko said his government was preparing to tighten its blockade of the separatist-controlled regions in the east, despite provisions in the Minsk agreement calling for restoring pension payments and other government aid to those areas. Mr. Poroshenko acknowledged in the interview that conditions were increasingly desperate for civilians who remained in the east, many of them older people and the infirm. But he said that his government had no choice but to seal the region off and that pressure from the separatists would cause many residents there to refuse aid from Kiev even if it could be delivered safely. In a sign of how the country’s Western supporters say things are changing in Ukraine, Mr. Poroshenko said his government would support a gay pride parade scheduled for Saturday in Kiev, which had drawn threats from right-wing groups. His stance contrasted sharply with that of Russia, where an effort to hold a gay pride march was quashed in Moscow last week and participants were arrested.